Oh my goodness, I cannot believe the summer is over! I didn't turn on my sewing machine much, and honestly, we were almost too busy to even notice. 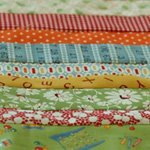 My kids are back in school now, as of last week, and I'm ready to start sewing again. I posted about this quilt a while ago, and here's the finish. We were able to gift it to our neighbor who graduated from High School last June. It was so fun to make and fun to give. The kids each made their own blocks, and loved making them. Speaking of sewing with kids, this was such a great project. Each block is easy enough for even the little guys, and it didn't take much time to finish. I put the quilt top together and did the quilting and binding, but they still felt they had a part in the quilt. We labeled each of the fox noses with the child's name. We used leftover orange scraps for the binding, a scrappy binding. A grey woodgrain for the backing. Pattern is Fancy Fox and can be found here. It is fantastic, and I absolutely LOVE that little guy poking his nose in from the top of the quilt. It adds such a beautiful touch of whimsy and wit. I forget how much I love a scrappy binding. Super cute. And I love the upside down fox. What a great kid summer project!! 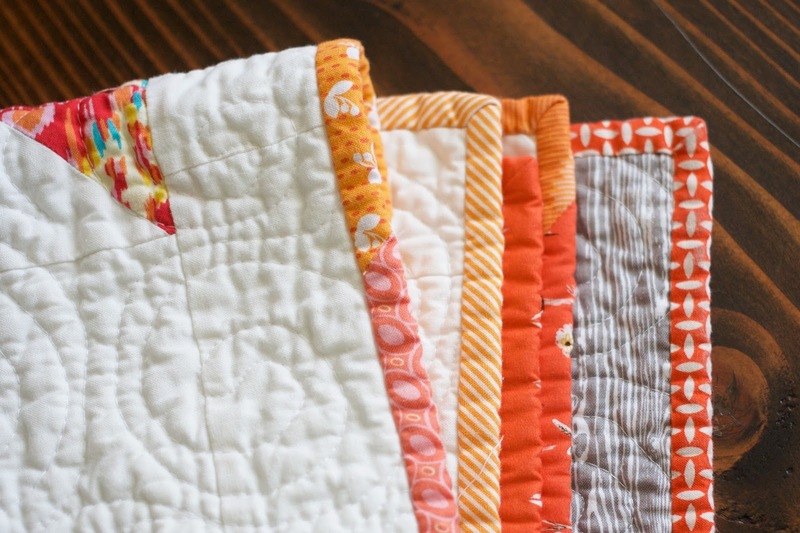 Such a cute quilt. 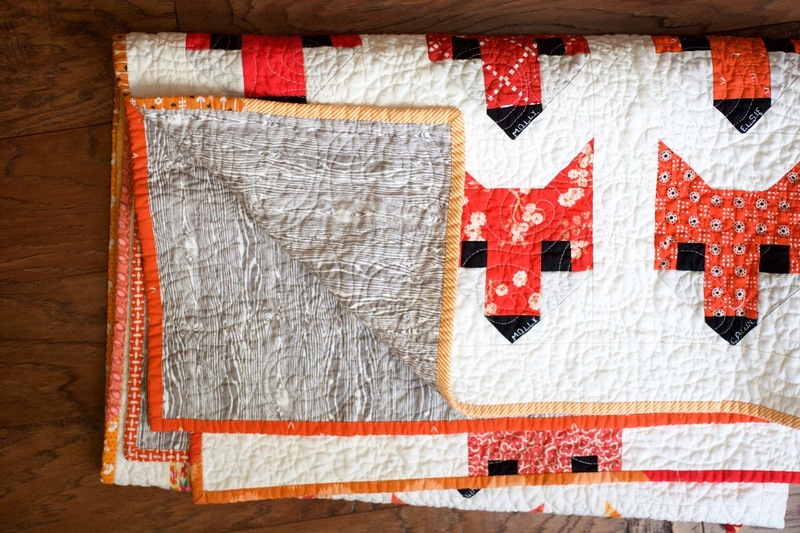 Super cute quilt! 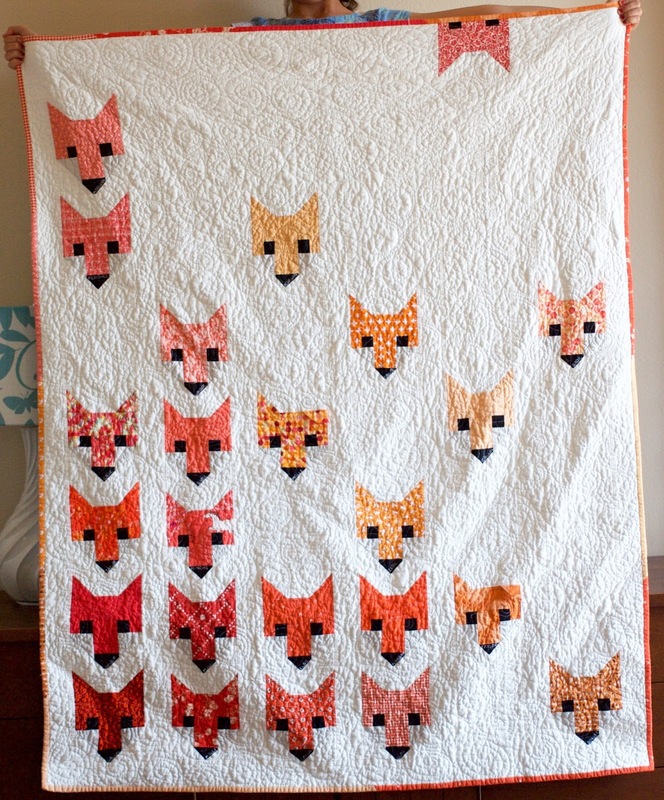 Love how you placed the foxes and the wood grain fabric. Thanks for sharing. 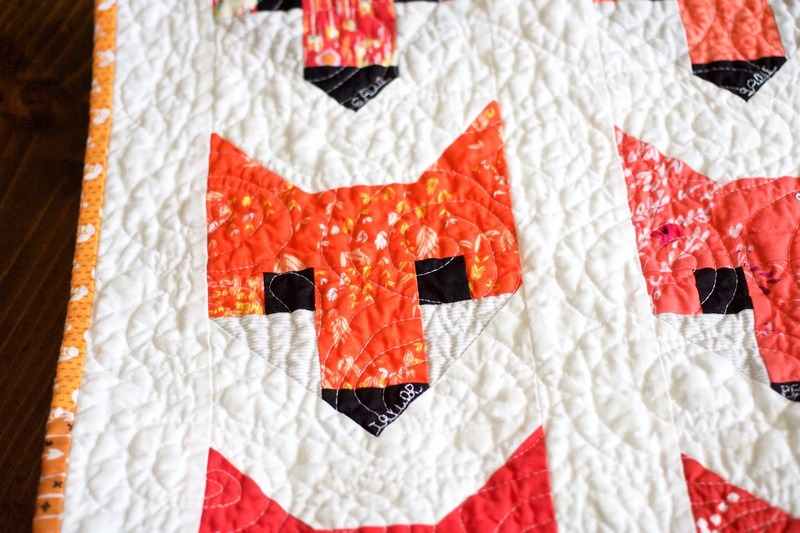 Love this foxy quilt! The layout reminds me of an arcade game. V.cool! This is really cute. 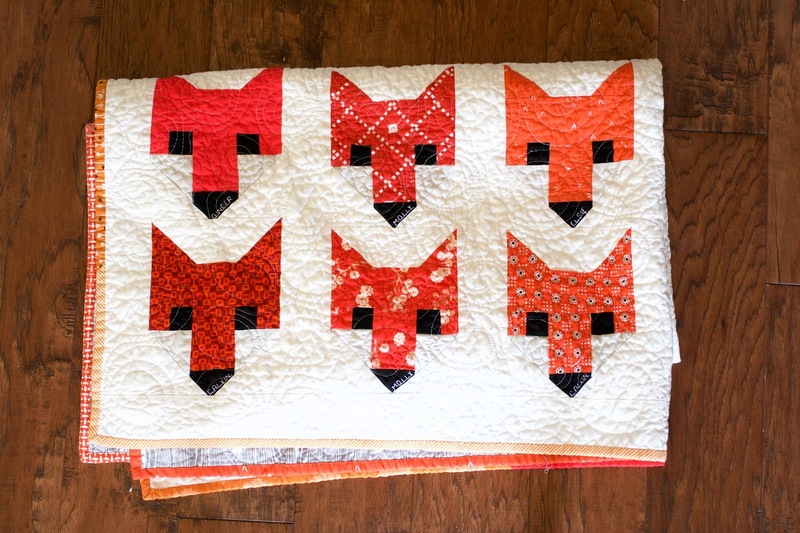 Love all the different fabric you used for the foxes. goodness, what a cute version of this pattern! i especially love the fox with his ear down and the one peeking out at the top. adorable! 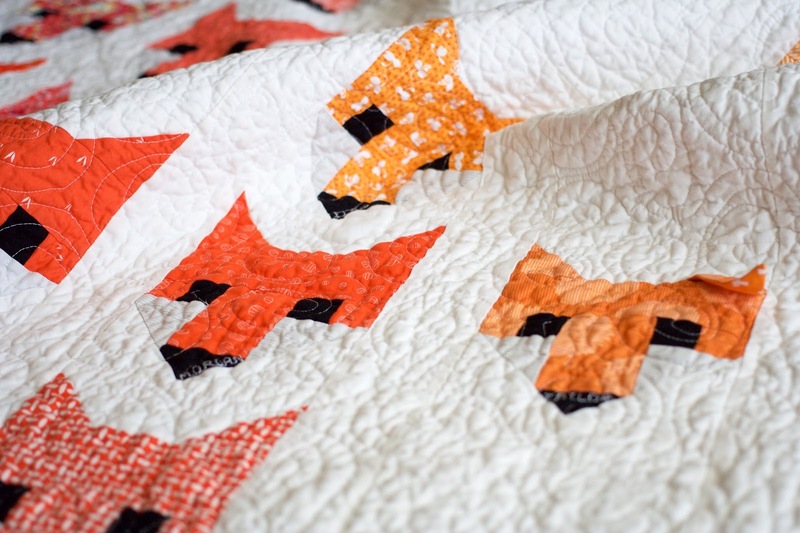 What an adorable version of the Fancy Fox pattern! So cute! I just purchased the pattern, but the 8" blocks appear to be much larger than those on your quilt. Did you reduce the size? Omg I love foxes and this is super cute!